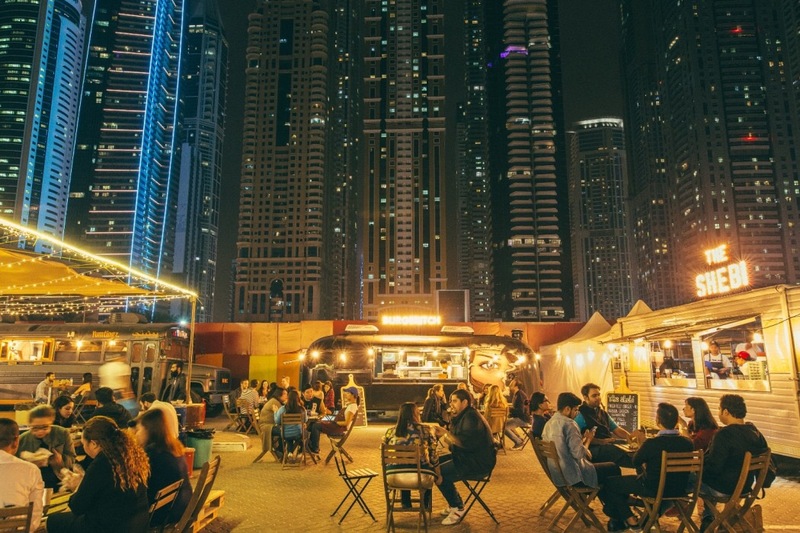 Dubai’s first street food market for adults kicked off last Thursday. This new licensed street food event known as Street Food Market DXB was held in Dubai International Marine Club last weekend. If you have missed it, you can still visit the event on January 26th-28th. This fun event is conceived by the creators of ground-breaking events like Street Nights, Food Truck Jam and Truckers DXB. It is a perfect event to attend in this beautiful weather. The event is for adults over the age of 21 years. The entry fee is 10 AED per person. Opening hours are from 8pm to 2am on Thursday, 12pm to 12am on Friday and from 4pm to 11pm on Saturday. You can expect restaurant pop-ups and food trucks. Culinary talents dishing out original creations. Local DJ’s playing music from all genres from hip hop, R ‘n’ B to regge and rock music. If you are in an adventurous mood, you can also try their mechanical bull or the rodeo bull. Great atmosphere and good vibes. Burger Itch, a gourmet burger concept. Their doughnut burger was a huge hit with my friends. Cafe Isan for home-style Thai food from North Eastern Thailand, Isan. Ka’ak Al Manara for the popular Lebanese ka’ak bread with various fillings, both savoury and sweet. Moshi, a popular home grown concept offering fusion sushi and momo. Moti Roti, a fresh modern take on Pakistani and Indian food. Raclette serves the popular Swiss dish made of baked baby potatoes topped with the melted raclette cheese, with a side of cornichons and Rocca leaves. Wingsters UAE for buffalo wings, burgers and milkshakes. Sir Lion & Sons is a gourmet meatery offering high quality meats and burgers. Nattas for traditional Portuguese bakery products. Huguette and Guy offers traditional French crepes. Jammin’ Chicken brings the flavors of Jamaica in juicy succulent jerk chicken. The Shebi for a creative twist on Indian and Lebanese street food. Yumtingz is a modified school bus serving classic street food. I love their salads and Parmesan truffle fries. Zapie Kanka is a street food concept from Poland. It serves open-face sandwiches with a thick drizzle of cheese. I tried it for the first time and absolutely relished it. 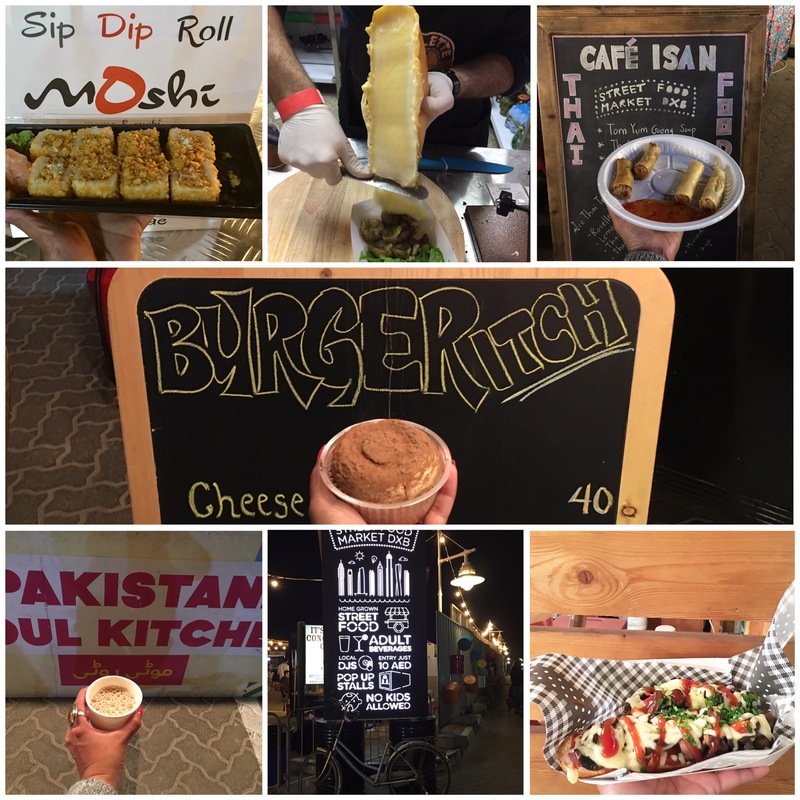 Street Food Market DXB is a definite must-do experience in Dubai.